Although we might take some flak from guitarists, we bassists know the truth: a band just wouldn't be the same without the deep, rumbling tones of the bass laying the foundation for everyone else. Any instrument can play a memorable tune, but it's up to the bass guitar to really put in the heartbeat and soul that separates a great song from an average one. Naturally, giving a great performance is all about being in touch with your instrument, and for that, you'll want to take a careful look at the basses here to find the one that fits you best. First and foremost, it's hard to go wrong with the classics. 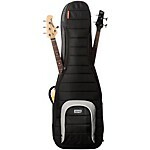 Fender can definitely take the credit for making the bass guitar the instrument it is today, and with a Precision Bass or Jazz Bass from Fender or Squier, you can experience the sound and feel that laid the groundwork for all others. Of course, what those others have done with the bass guitar is nothing short of amazing, and you'll also find plenty of artisan axes here from the likes of Schecter, Rickenbacker, Warwick and more. The bottom line is choice: there's a bass to satisfy any player. If you really want to distinguish yourself as a bassist, it can pay to think outside the box and go for something a bit less traditional. 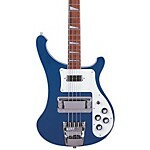 For example, there are musical styles and occasions where an electric bass may be slightly out of place. 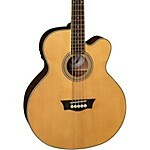 In those cases, you can turn to an acoustic-electric bass. These have a classic sound all their own, and if you're headed to a festival or singing around a campfire, they'll do the job even without an amplifier handy. No matter how you choose to distinguish yourself - acoustic-electric, custom, signature model, extended range or the tried-and-true standbys - one thing that will never change is that music is a personal thing. Only you can decide which bass guitar belongs onstage and in the studio with you, so you've got every reason to check out all the instruments here: chances are you'll know the right one when you find it.